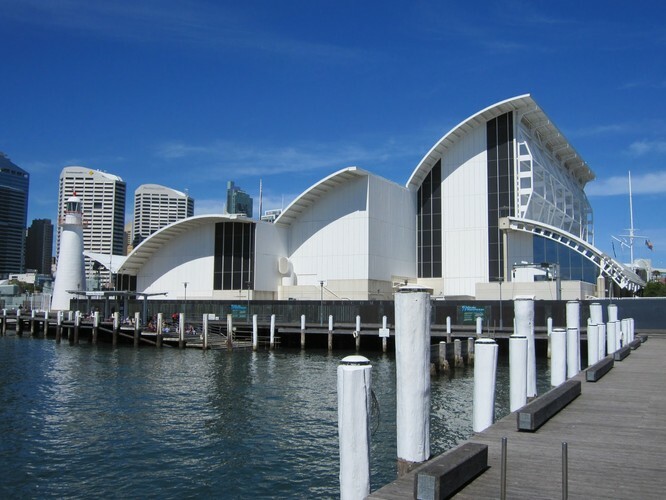 The Australian National Maritime Museum, on the western shore of Sydney's Darling Harbour, is in a lively heritage precinct with many attractions. The distinctive main building, with a roofline evoking waves and sails, houses exhibitions that explore Australia's links with the sea and consider how maritime activities and issues have shaped the lives of people in Australia. Wharf 7 Maritime Heritage Centre next door is the museum's 'backstage' area, housing the Vaughan Evans Library, museum collection storage, boatbuilding workshops, the conservation laboratory, ship model workshop and display area, a design studio, photographic studio and other facilities. Guided tours are available. At our wharves, we have one of the largest fleets of any museum in the world. The 14 vessels include a former navy destroyer HMAS Vampire, a former navy submarine HMAS Onslow, a full-scale replica of Captain Cook's ship Endeavour and a variety of smaller vessels scaling down to an 8.6-metre couta fishing boat. Creating a Heart Based World: After 2012 - What's Next?